As members will know, the Philological Society is the oldest learned society in Great Britain devoted to the scholarly study of language and languages, demonstrating its endeavour to promote the study and knowledge of the structure, the affinities, and the history of languages through regular talks, the publication of the Transactions of the Philological Society, and a monograph series. To further the engagement with languages and linguistics even more, the Society will host an Early Career Researcher Forum on 8–9 March 2019, and thus invites submissions of abstracts for 20-minute oral presentations or poster presentations on any topic of research within the Society’s interests from Early Career Researchers (late-stage doctoral students and post-docs) as well as from individuals conducting linguistic or philological research not ordinarily employed in an academic position or higher education. The ECR Forum will take place at Wolfson College, Oxford. Next to paper and poster sessions, there will be two workshops on journal and monograph publishing (led by Prof. James Clackson, Cambridge, and Prof. Susan Fitzmaurice, Sheffield) and on grant applications (led by Prof. Aditi Lahiri, Oxford). After the conclusion of the Research Forum, Prof. Rudolf Wachter (Basel) will give a paper at an ordinary meeting of the Society. Anonymous abstracts of no more than one page (DIN A4 or US Letter, Times New Roman, 12pt, 2.5cm margin on all sides) including references, diagrams, and examples may be submitted electronically in PDF format to PhilSocECRF@gmail.com no later than 12.00pm GMT on Friday, 14 December 2018. Applicants should indicate whether they intend to give an oral or poster presentation, or are open to either. Submissions will be evaluated by the scientific committee and speakers informed about their success by 31 January 2019. Speakers who join the Society at the student/ECR rate (£20 for 5 years) will be eligible to apply for a bursary to cover travel and accommodation in a College (or similar). All queries and questions should be directed to the Society’s Hon. Secretary for Student Associate Members at: robin.meyer[at]ling-phil.ox.ac.uk. A downloadable version of the Call for Papers is available here. The Oxford Latinitas Project promotes the fluent speaking of Classical Latin as an essential part of scholarship (and love) of the Litterae Humaniores. This week, the project will host visitors from the Accademia “Vivarium Novum”, Italy, for a seminar discussion of classic texts on the theme of ‘humanitas’, accompanied by musical settings of ancient poetry. Refreshments will be served, and thereafter those who wish may join us for dinner in the city centre. The entire evening will be conducted in Latin. Active participation is of course encouraged, but those who simply wish to observe and listen are also most welcome! It will be an excellent opportunity to get a taste for this exciting way of approaching the classical works and the languages they were written in as living things. 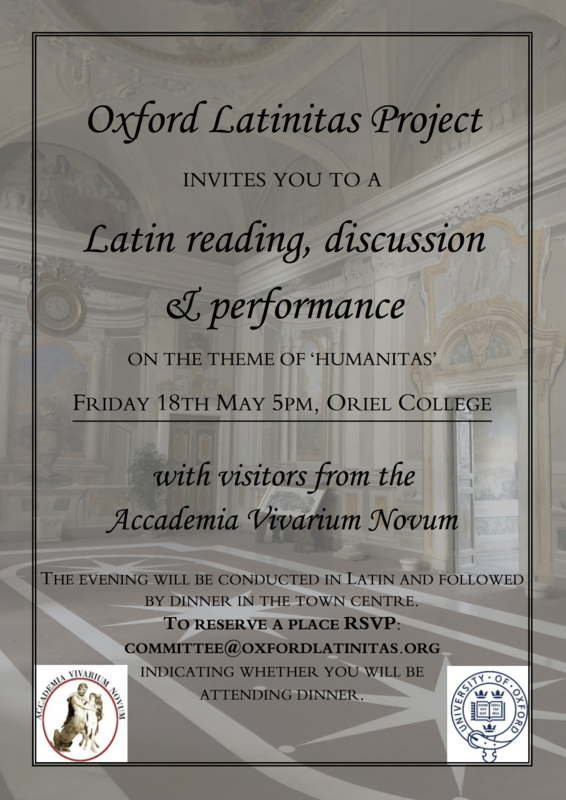 In addition to the main event Friday evening, the Vivarienses will be taking over our regular weekly sessions: Lumen Litterarum, on Wedensday, 16 May, at 12:00 in Oriel, and the Familia Romana / Roma Aeterna sessions at Brasenose College, Friday, 18 May, at 12:30 PM. Please do RSVP, indicating whether you would like to join for the seminar, dinner, or both, or if you would like to come to Lumen Litterarum; no need RSVP for FR / RA. Wolfson College, Oxford, and the Faculty of Linguistics, Philology and Phonetics at the University of Oxford are pleased to host an Indo-Iranian Philology Day on Saturday, 28 April 2018, at Wolfson College. This day celebrates the long-standing tradition of teaching Indic and Iranian languages as well as Indo-Iranian Comparative Philology at the University, and will showcase the breadth of the field as well as the fascinating connections with other areas of study. The day begins with a lecture introducing Indo-Iranian Philology. Thereafter, the morning consists of three sets of short introductory classes in Vedic and Avestan language and texts, as well as a brief survey of Indo-Iranian and Indo-European Comparative Philology and Old Persian Cuneiform. After a buffet lunch, four lectures by international and local scholars on a number of religious, historical, and literary topics relating to the Indo-Iranian world will round off the day. The Indo-Iranian Philology Day, sponsored by the Lorne Thyssen Research Fund for Ancient World Topics and by the Faculty of Linguistics, Philology and Phonetics at the University of Oxford, is open and free to all who are interested. For catering and room booking purposes, we ask that you register on our Eventbrite site, where you can also find a full programme of the day. Armenian is one of those Indo-European languages that very rarely gets much attention from students of historical linguistics or comparative philology; most frequently, it crops up only in discussions of the augment, laryngeals, and the Glottalic Theory. This, alas, is unlikely to change. Yet, Armenian can serve as an interesting case study for a number of fields within linguistics, not least language contact and corpus linguistics. With these two topics in mind, allow me to introduce you to Armenian – albeit in extreme brevity –, and to illustrate one of its more curious traits: its two grammars. Armenian, attested in its Classical form (called գրաբար |grabar|) since the 5th century CE, is a language with a couple of twists. Until a ground-breaking paper by Heinrich Hübschmann (1875), Armenian was thought to belong to the Iranian language family. In fact, Armenian is most closely related to Greek – and even that not all that closely (Clackson 1994). For the most part, this relationship is not immediately obvious at the surface, particularly if compared to the similarities between, for instance, Vedic and Old Avestan, or Latin and Oscan. The reason for its historical allocation to the Iranian family lies in the inordinate amount of Iranian loan words and calques, both lexical and phraseological, in Armenian. These are mostly taken from Parthian (North West Middle Iranian; Meillet 1911–12, Schmitt 1983). Less obviously, even certain Iranian syntactic structures and patterns have been replicated (Meyer 2013, 2016). These borrowings are, without doubt, owed to long-lasting contact between Armenian and Parthian speakers. Since the 5th century BCE, Armenia was under Iranian rule in one form or another: Achaemenid, Artaxiad, Arsacid Parthian, and later Sasanian Persian. For the most part, an Armenian king of Iranian origin ruled as primus inter pares among other Armenian and Iranian noble families. The history and ethnic composition of Armenia is, of course, far more complex than can be described in one sentence; excellent summaries can be found in Hovannisian (1997).